Since my last blog over three months ago, a lot has happened in China. Things that were planned, such as going to Hong Kong, didn’t play out quite like I had expected. The winter stayed rough, and the homesickness grew stronger with every day that went by. By the time final exams came during the latter part of January, not only myself but many of my classmates had grown quite tired and we had all lost a bit of our motivation.Â For me however, my attention was focused on my return trip to America that was scheduled for the very end of January. I was fortunate enough to be able to return home for a few weeks during the Spring Festival. After exams had ended and before I left however, there were many changes in the campus and the surrounding area. Since many of the other students had finished their exams before the foreigners, many students had already returned home, and stores began to close. Even in Back Street, the area behind the foreign student dorm that holds many independent shops and restaurants, had begun to shut down some, as people returned to their homes and spent time with their families. Although the campus was getting a bit quiet right before I left, it apparently became much worse after I left, and became eerily similar to a ghost town, as my friends referred to it. When the day finally came to return to America, I couldn’t have been more excited. It was a really long and tough journey, but I eventually made it. Being back in America was amazing, and so many things that I used to take for granted felt like luxuries to me (such as having heat and a drying machine). I spent a lot of time eating a lot of the foods that I missed, most notably Taco Bell, and seeing a lot of friends again. Even if I was just relaxing at home, the fact that I was at home and in America made it very enjoyable. It really helped to refresh me, both physically and mentally, from the long time spent in China. Most people that go there for a short time, such as a few weeks orÂ even a couple of months, tend toÂ think ofÂ it as paradise. While in many ways that may be true, once you spend a bit more time there and really see the country outside of your vacation bubble, it can be quite exhausting sometimes. That said however, China is still a really great place, especially if you’re a foreigner (normally meaning non-Chinese, but in this case it reallyÂ applies to non-Asians in general). In the last week of February, I left America again and returned to China. It was the longest journey I’ve ever made in my life, but after over 30 hours of traveling, I finally made it back to my dorm around 3Â A.M., on a particularly warm morning. After I got back, getting used to things again happened very quickly. I was a little worried that my Chinese had gotten rusty while I was back in America, because I didn’t really use it much when I was home and I really didn’t want to much either, but I was pleasantly surprised to find that it was actually just about as strong as ever. Class started a few days after I got back, and we all got back into the groove of things. Since then, a lot of things have happened. As well as strengthening the friendships with many of my current friends here, I’ve made many new friends, and had a chance to experience a lot more of the nightlife in Changsha. I’ve seen many new parts of the city, and discovered some things that I didn’t know existed before. I also just recently returned to my English school to work part-time again. As well as that, I celebrated my 24th birthday here a few weeks ago, and enjoyed St. Patrick’s Day Chinese-style, with some friends from Brazil, India, and Turkmenistan, as well as a few Chinese friends. Definitely one of the more memorable birthdays that I’ve had in my life. I’ve also been busy planning trips for the near future. Still on the list are Shenzhen andÂ Hong Kong,Â as well as return trips to Guangzhou, and Shanghai for the 2010 World Expo. As well as that, I’ve been planning my own trip to Beijing sometime in May or June, to visit the the UofL students that go to Bei Wai (Beijing Foreign Studies Univeristy) every summer. I’m actually quite eager to return to Beijing, as it’s a very fun city, and after spending a long time in real China a visit to Beijing is a great way to relax and have some fun. I’m also eager to have some fun with the pirate-like accent found in Beijing, where you can throw r’s onto the ends of words seemingly almost at free will. However, the timing of the trip is a bit difficult, as I’m already quite busy and things will likely only beÂ busier around that time. Despite that, I’m reallyÂ looking forward to going to Beijing again. With the HSK exam looming in the distance, I’ve been making every effort to improve my Chinese as much as I can. I’ve found some new ways to expand my vocabulary and understanding, and I feel like I’ve been making a lot of progress. The HSK exam however will be no easy task. As our teachers have informed us, on the HSK exam, there are four sections: Listening, Reading, Grammar, and Comprehensive. I’m not sure what exactly Comprehensive consists of, but I believe it also involves a lot of reading. Thankfully, there is no writing on the HSK exam at all, it’s all multiple choice. However, our teachers have also informed us that the section that you perform theÂ weakest on limits your overall score. So, let’s say you scored an 8 on everything but Listening, and got a 6 on that. From what I understand, that means your overall score is a 6. Which basically means that you need to be really well-prepared for this exam, and you have to work on your weaknesses as much as you can. In other news, there was a holiday here this past weekend and Monday, known in China as æ¸…æ˜ŽèŠ‚ (qing ming jie), which literally translates to something like “Clear and Bright Day” but is called “Tomb Sweeping Day” in English. Despite the rather gloomy sound of it, it’s actually not a particularlyÂ sad holiday. Qing Ming Jie is all about paying respects to one’s deceased ancestors, and people will travel to where their grandparents or other ancestors are stored, and will sweep and clean their tombs. If they don’t have a tombstone, as many people are cremated and their containers are stored in buildings, then their containers will also be swept and/or cleaned. An interesting holiday, but unfortunately, as a foreigner there wasn’t much for me to do except enjoy the one day off from class. There are probably an endless number of things and experiences that I can talk about, but I’m going to end this relatively short and just say that a lot has happened in the past few months, and my understanding of and appreciation for China has grown quite a bit. As I spend more time here, I can feel myself growing in ways that I wasn’t able to do back in America. Not only is my Chinese improving more and more, but my understanding of the world and other cultures is growing. It’s not always easy being here, but it’s a truly rewarding experience. And even though I miss home sometimes, I’m really glad that I made the decision to come here and do what I’m doing. It’s an adventure that I will definitely never forget. I would strongly recommend that for anyone who has the opportunity to come to China, do it. But do yourself a favor and take some time to learn about the culture and the people first, because that makes a huge difference. Now that I have my long introductory post out of the way, I can talk a bit about how things have been since the beginning and especially recently. Well, it’s almost Christmas time, and I’ve been here for about 3 andÂ a half months now. Surprisingly, many people are interested in Christmas here. There are a lot of decorations and Christmas songs being played on the streets. Even all of the McDonald’s and KFC restaurantsÂ are putting up a lot of Christmas decorations. I don’t really go into those places a lot back home, but I don’t really remember them doing that much in America, so I was a bit surprised. Nevertheless, Christmas here is still not the same as it is back home, and I have yet to decide exactly how I’d like to spend it. I’ve had several students invite me to Christmas parties, but I really haven’t gotten any specific details yet, so I’m not sure what will happen. Regardless, I shouldn’t be spending it alone, which I was a little worried about at first. Unfortunately, I do have to attend classes still, but only for 4 hours. Winter here is especiallyÂ rough… Although the temperature has been more or less around the same as it has been in Louisville, and generally speaking the average temperature in winter is warmer here, it often feels far colder here than I remember feeling back home. The reason for this is that southern China has yet to implement veryÂ effective heating or insulation. Simply put, until recent years, it’s beenÂ usually warm enough that those things just aren’t really needed that much. So, with terrible heating and insulation, there is really little relief from the cold. There are heaters in the dorm rooms, but a lot of the warmth escapes and the cold still enters.Â Also, unlike in America, where most of us are used to going outside and getting right in our cars, that doesn’t happen often for a lot of people in China, especially students. We’re forced to be outside in the cold more, which means that we actually have to deal with it, unlike many people in America. Chinese are also much more conservative with their energy, which means that going into a lot of buildings means you keep all of your winter gear on, as the heat isn’t used much. This can be mildly annoying sometimes, such as while eating at a restaurant, but in general it’s not really a big deal, just something to get used to. Students who have been to northern China in the winter, like Beijing, have probably experienced something very similar to this, except that northern China tends to have much better heating and insulation. So while it’s much colder there usually, there is also quite a bit more relief from the cold weather too. In winter, it is also not uncommon for the water to stop running every so often. Just last night in fact, my water stopped running for several hours. It can be very frustrating because you don’t know when it will shut off, or when it will come back. You can get caught offguard in some very unfortunate situations if you aren’t careful. Usually it doesn’t stay off for very long, and if you really want, you can go down to the first floor with a bucket and bring some water back to your room, but at least for a spoiled American like myself, that’s not very convenient. Also, this is around the time of year when students start running out of electricity. In my case, I’ve already had my electricity cut offÂ three separate times. The first two times were actually because of a malfunction with my electricity remote. I don’t know the details, but I know it wasn’t my fault. The third time however I had to buy more electricity, which is fairly cheap, but is still a minor inconvenience. The problem is that when this happens, the electric company may not be open and you may have to wait. I’ve spent several very cold nights asleep in my bed, waking up as cold as ice, feeling the cold all the way down to my bones, with no hot shower to revive me. That’s the reality of being here in China during winter, and experiencing the lack of luxuries that many of us in the West are used to. The classrooms aren’t heated that well either. There is a heater in the room, but it doesn’t always work, and it takes time for the warm air to disperse. Sometimes going to class can be a pretty brutal experience, and for that reason many students skip in theÂ winter. Usually it’s not a problem, but there is one teacher in particular who seems to mind, andÂ while I won’t go into details here, I’ll justÂ say that there have beenÂ some times where the office has implemented some strategies that most of us in the West would not agree with very much. So, without much relief from the cold, and with the office occasionally pressuring students to go to class, many students oftenÂ feel sick here. Thankfully, I’m in a class full of doctors, so I’m always able to get theÂ medical advice that I need. Aside from all of that fun stuff, there are a few things that I’ve gotten quite used to in China. One of my favorite drinks here in China is milk tea, or bubble tea as we tend to call it back home. For those of you that haven’t had it, it’s a very Asian drink, and consists of some kind of milk and tea mixture, and often has little black balls of tapioca at the bottom, or sometimes other things suchÂ as pieces of fruit. It can come in many, many different flavors though, and I’ve learned how to say the names of fruits in Chinese very well from trying to decipher milk tea menus. It’s also extremely cheap, ranging from as low as 2 RMB for a small cup to 4-5 RMB for a large cup, which isÂ roughly the equivalent of about 30 cents to 60 – 70 cents. It’s great anytime of the year, because you can get it ice cold, or really hot, so it’s been especially helpful for me in the winter. My favorite flavor so far is definitely banana, but I also really like peach and taro flavor. Definitely give this stuff a shot if you ever visit Asia, and fortunately, it’s just about everywhere in most Asian countries. As well as milk tea, I’ve also gotten very used to attention from Chinese people. As I explained in my previous blog post, I’m kind of a rare person in this city, and I’ve gotten very used to beingÂ approached by people, students especially, wanting to treat for me dinner and get to know me and practice English. I’ve also gotten used to a lot of funny comments from children or other surprised people. Children especially for example, when they see you, will shout “Waiguoren!” to their parents, which means foreigner. They also like to stare a lot, andÂ some of them will even try to talk with you in English. Unfortunately with children, the conversation usually consists of a machine-likeÂ greeting and asking how you are, and after that they usually revert back to Chinese. Older students will often do this as well though, but they aren’t always as obvious. You can often hear girls whisper “waiguoren” to each other, and more often than not, within a few minutes they’re introducing themselves to you. Just the other night I was shoppingÂ at Wal-Mart, looking for some tuna, and I entered an aisle and immediately heard the familiar word from a group of three girls that looked to be high school students. As I walked by, one of them shouted “Hello!” to me, and I responded, but they were a bit shy so the conversation more or less ended with that. As I’m quite used to this by now, and since I was on a mission for food, I didn’t dwell on this too much and I went along my way. But as I continued my search, at least for a little bit, they continued to follow me for a little while, whispering amongst themselves. That brings me to another point. One of the funniest and most enjoyable experiences about learning Chinese is hearing what they say about you. Thankfully, it’s almost always with good intentions, and very rarely offensive. Aside from “waiguoren”, it’s alsoÂ very common to hear them whisper “shuai ge”, which is like saying “handsome guy”, even from guys. They also really tend to like commenting on our noses, since Asian noses are generally a bit smaller and not as long, and they’re not used to seeing ones that look different. My nose in particular is a bit pointy, and so the contrast between my nose and theirs is obvious. They never mean to be offensive about it, but they can’t help but comment on it either. It’s really funny being with a group of Chinese that you don’t know wellÂ and hearing them whisper “da bizi”, or “big nose”, to each other and then a few minutes later leaning over, and while smiling, saying “Oh, I can speak a bit of Chinese, you know.” There was however one experience on a train, when my friends and I were coming back from visiting Yueyang, that was particularly interesting. We had decided to buy the cheap seats since the train ride was only an hour and a half long (and when I say cheap, I’m talking less than $5). However, it’s very rare to see foreigners in that section of the train, and some people will stare even more than normal because of it. So, we were sitting in a large booth with a Chinese couple and an older Chinese man. Well, the Chinese man stared at us like we were exhibits at a zoo. The entire train ride, he didn’t take his eyes off of us. The man even had some short conversations about us with some nearby Chinese. Eventually, we revealed that we could speak a little Chinese, which made the situation even funnier, but the man still kept staring. At one point, to be funny, my friend offered the man a cookie. He didn’t want it, but my friend insisted, and eventually the man took the cookie, only to promptly place it on the table, and turn his head back to resume staring. That was a fun train ride. Another interesting thing that often happens because of the fact that I’m American is that whenever something tends to go wrong here at the school, or there is some conflict involving the studentsÂ and some form of authority, if I’mÂ involved,Â some of the other students tend to look at me as a bit of a shield. Not because they have no regard for my own well-being, but because of the deep respect that the Chinese have for Americans, and in extreme cases, the fear of having to deal with the American Embassy. It’s no secret that Chinese, including the administration here, treat Americans and other Westerners better than they do other foreigners. So often times it’s better for me to be the person talking to someone when there’s a conflict, because of the difference in treatment.Â In extreme cases, this is still true, because not onlyÂ is the American Embassy more feared and respected, but most other foreigners come from countries where the embassies are not taken as seriously, orÂ the embassies themselves won’t even do much to help. Sometimes even the threat of contacting the embassy is enough to get things done. While I personally have not had much problems with the administration here, I do know others who have, andÂ I’ve heard stories involving some major problems as well. Even in situations as simple as waking up the lady in charge of the dorm to open the door and let us in during the middle of the night, which is really not a big deal at all, some students prefer me to be the first person seen, as they know that I will be treated better and probablyÂ won’t get yelled at. Even in the unlikely event that there is a major problem,Â there’s always the threat of the embassy to protect me. I’m not too fond of exercising this semi-invulnerability that I seem to have though, but it is really nice to know that it’s there if I need it. One of the major downsides to life here is that, once again because I’m a young American and a native English speaker, people always want my time, and so I very rarely feel like I have any free time to spare. On the weekends and on some weeknights, I often go to an English school for young children, and give them reading lessons. This is actually the part-time job I referred to being offered in my last blog post, so I’ve been doing it for quite awhile now. It’s a really easy job, andÂ actually pretty fun, but it does take up a lot of my free time. Fortunately, because it is an English school, it helps me to feel very at home there, as all of the teachers know English very well, and most of them are around my age or slightly older. Also, as part of their obsession with American culture, they often learn about many American things, including the holidays. Halloween and Thanksgiving were practically non-existant in the city, but at that English school, for a little while I actually felt like the spirit of those holidays were there, and it really helped me to feel at home, and like I wasn’t missing out on some of those things. Regardless, between this English school and the many, many students and various other people I’ve met wanting to get to know me better, I don’t have a lot of time to myself. However, when I do have free time, I really likeÂ going out into the city and having fun. There’s actually a cafe here owned by an American, called the Fifth Tone, and on Friday nights they have live music. This place has the highest number of foreigners together in one place that I’ve ever seen in this city. It’s the only place where the number of white people actually rivals, or even outnumbers, that of the Chinese. Usually the Chinese that come in are ones that are really interested in learning English, and so it’s a great place to meet both foreigners and Chinese. I’ve met quite a few foreigners there, but as I’ve mentioned, most of them are older and are always English teachers. I’ve also met a few really nice Chinese people too, including a young guy who has just started his second business. He’s a young Japanese major at a nearby university, but he already owns a milk tea shop and just opened a Japanese-style tea house at his university. When he opened his shop around a month ago, he invited me to attend, saying he was having a little bit of an opening party. What he didn’t tell me was that I was going to be one of the only foreigners there, and that upon arriving, there would be hordes of Chinese students waiting to meet me. Needless to say, that was a fun night, and I met a lot of new people and had a chance to improve my Chinese a lot. I’ve been back a couple times, and every time, he always insists on providing free drinks and finding interested students to chat with. His idea is to turn the place into something similar to the Fifth Tone, and has asked for the help of my Brazilian friend (who also speaks near-native English) and I to come by every so often and practice English with interested students in order to help him do that. Being that he’s just an all-around awesome guy, and it’s really a lot of fun being there, we had no problem with the idea. However, we’re still trying to get a normal schedule set up, since my Brazilian friend and I are both extremely busy. It’s also a bit weird still being in classes now, and seeing on Facebook (yes, it’s blocked in China, and yes, I know how to get around it) that all of my friends are out of school now, and in fact, many of my former classmates are graduating. I delayed graduation by yet another year to come to China, and while I know that it’s one of the wisest decisions I ever could have made to delay graduation and do this, it is a little sad that when I return and finish my degree that many of my friends will be gone. Either way, that’s that, and I can’t change it now, nor would I want to. While most of them are relaxing now and enjoying their winter break, I still have an entire month of class left, followed by finals. I do get a brief break for New Year’s though, in which my friends and I plan to visit Hong Kong. That should be a fun experience, although it will cost a bit of money. Thankfully, things are cheap enough in China that money is really not an issue at all, even during a trip to a more expensive place like Hong Kong. Originally I intended to write more in continuation of my last blog post, as I mentioned I would in said post, however a lot changed shortly after that. Not only was I busy with my summer class at UofL, which included having quizzes every other day, four exams, and a huge 15+ page paper due all within 4 weeks, but I learned that I received a full scholarship from the Chinese government to study abroad in China for a year. Unlike most students studying abroad however, my study abroad is not connected to UofL in any way whatsoever except for the fact that I have to registerÂ for a special course to remain a student until I return, and my purpose for going is purely for language, not for business or anything else related to my major.Â To make a long story short, there was a lot of confusion and work to be done with the short notice that I was given (I had only a month’s notice ahead of time that I received the scholarship), which involved workingÂ with several very helpful staff members at UofL (thanks to everyone for that). In the end, things turned out quite a bit differently than I had imagined. Originally I had planned to return to the Beijing Foreign Studies University in Beijing, as I’ve completed two summer study abroads there, and UofL has quite a good relationship with that university. However fate had other things in store for me, and through some confusion with my scholarship application, I was assigned to a different university, far away from Beijing. Instead, I was toÂ attendÂ Central South University (ä¸­å—å¤§å­¦), located in Changsha, Hunan province. Now, Central South University is also a very good school and very famous in China, but it wasn’t what I was expecting, and it took some time to get used to the idea. Nevertheless, eventually I decided to accept the scholarship, and on September 3rd I left America for China. To give a little background information about where exactly I am,Â Changsha is located in the southern part of China, in Hunan province, while Beijing is located in the northeastern part of the country, roughly 1550 kilometers away. Changsha is in relatively close distance to famous cities such as Guangzhou (Canton), or Hong Kong, with the former being reachable in 7-8 hours by train, or within a mere 3 and a half hours with the new train system that starts operating on December 26th. Changsha is also the capital city of Hunan province, and was once the home of the famous Mao Zedong. That said, Changsha is an important city both in modern times and in recent Chinese history. When I left for China, I felt really unprepared. I was worried I didn’t pack enough things, and that I may have left something behind. To make matters worse, I was having a difficult time contacting the Overseas Office at CSU, and was unsure whether anyone would be at the airport to help me out when I arrived. Having e-mail as the only method of communication, I had waited several days before leaving to receive a response regarding my request, and at 5:30 the morning of my flight, I had still notÂ received a response and it was time to go. So I took a risk, and got onto the plane and left for China. At this point, aÂ very long adventure began, and things were not as smooth as I had hoped they would be. While I’veÂ traveled and flown alone more than a large majority of people my age, this was the first time that I was traveling to another country alone. My previous two trips were with a group of UofLÂ students, with someone in charge to guide us. This time though, I was entirely alone. That being said however, the first part of the trip went fairly well. I went from Louisville to Chicago, and stayed there for a few hours until boarding a flight to Shanghai around 12:45 pm. From there, a long, grueling 14+ hour flight began. I slept quite a bit, having stayed up the entire night before, but I also spent quite a bit of time watching movies, so while it was a very long flight it wasn’t quite as bad as what it may sound like. After I arrived in Shanghai though, the real fun began. Now, Shanghai has two airports. One mainly used for international flights, and one used for domestic flights. I obviously arrived at the international airport, yet my connecting flight to Changsha was in the other airport. So, it was up to me to figure outÂ a way to get across the city upon arriving in Shanghai. After I got through immigration, I immediately turned on my laptop to check for an e-mail from CSU. Unfortunately, my laptop had no power, and I couldn’t find an outlet nearby. Eventually, I was able to take my laptop to someone at a counter, however I was unable to access the internet without paying. At this point, being in China, I decided to try calling a phone number that came with my admittance letter to CSU, and I had the man at the counter help me out. To our surprise, the number on the letter was partially incorrect, and the call couldn’t be made. Luckily, the man was able to look up the extension for Hunan, and was able to correct the phone number and make the call. I spoke to someone at the Overseas Office who then informed me that he had indeed arranged for his assistant to meet me at the airport to pick me up. When I asked how I would know who they are, he simply said that they would find me, and not to worry. Well, I didn’t recall ever sending them a picture of myself, so I was still a little worried, but I had bigger issues to worry about at the moment, and getting to the other airport in time was crucial. Thankfully, the man at the counter was once again very helpful, and arranged for someone to help me with my bags and to take me to the other airport for a small fee. After about an hour to an hour and a half later, I arrived at the other airport with plenty ofÂ time to spare. I spent a bit of time waiting for my flight to Changsha, and I even tried napping at one point. There wasn’t much to do, and I didn’t have much Chinese money on me either, so it was pretty boring. Eventually, my flight did come though, and I boarded the plane for a short flight, slightly under two hours long. Unfortunately, my flight had been delayed by about an hour, and to my surprise, when I arrived in Changsha I was in an empty section of the airport, separate from the rest. As you may have guessed, there was not an assistant there waiting for me. There were also no other foreigners or English speakers there to help me, and my Chinese was not that good at the time. At this point I was pretty worried, as it was well after 10 PM, and I had no idea where the school was, let alone how to get there or where I needed to go once I arrived at the school. So, I thought for a moment about what to do, and I came up with the only idea I could. Being that I was the only white person on my flight, and taking a gamble and guessing that I was also the only white person in the airport at that hour, I decided to walk around and let my skin color do the work for me. It turns out that was a wise decision, because after walking around the airport for about half an hour, I finally stumbled into the other section of the airport, and I was very quickly approached by two Chinese, one of which was theÂ assistant that was supposed to be there waiting for me. They had become quiteÂ worried when they hadn’t seen me, as my flight had not only been delayed but also moved to a different terminal, and without any way for me to inform them of that ahead of time, they had experienced quite a bit of confusion while waiting for me. Fortunately they hadn’t left yet, and shortly after we met, we got into a car and left for the school. When I arrived at the school, it was almost midnight, and so I had a tough time getting a good view of the area on the ride over, including the school campus. When I got there, the lady who sits near the doorway of the dormitory and keeps track of who enters helped me get my room and had another foreign student show me where it was. While I won’t go into much detail now, I will say that the building is quite old and a bit different from what most people might expect when they think of a dormitory. But, that’s China, and it is the way it is. Fortunately, the foreign student dorm rooms are decent in size, and include bathrooms. Basically, a typical dorm room is like this: upon entry, there is a big main room, with a large wooden bench and a television. Behind that is another room with a bigÂ window and wires hanging across the top where you can hang your laundry (rooms on the other side of the building don’t have this laundry room, but instead have a balcony). Next to that is the bathroom and sink, as well as a bedroom. Back in the main room is an entrance to another bedroom. So, there are typically two students to a dorm room, but each has their own private room, which includes a desk, air conditioning, two dressers, and obviously a bed. Not too bad really, but as I’ve come to learn, there are many, many issues to deal with when living in a dorm in China. I briefly met my new roommate when I arrived, who turned out to be from Vietnam, but I quickly discovered that he didn’t know any English at all. Or Chinese. So things went pretty well that night, and I unpacked a bit of my stuff and got ready for bed, exhausted after a long day of travel. The assistant that I had met offered to show me around campus and help me buy a phone card in the morning, and so I quickly went to sleep so that I would be awake in time. After this began the start of one of the hardest weeks of my life. Now, I had traveled to China twice before this, and spent a combined 2 and a half months in Beijing, so being in China was nothing new to me. But for those of you that have been on previous UofL trips to China, and/or have only been to mainly big cities like Beijing or Shanghai, just trust me when I say that you know NOTHING about what China is really like. Beijing and Shanghai, as well as a few other cities, are quite differentÂ from most of China, and life there can be very different than in other cities. Things are more international, there are more foreigners, more English, more foods and suppliesÂ and other things that you might be used to. The services provided are better, and sometimes the customer service is better too. But mostly, the people are different. Sometimes this can be very advantageous, and in other times it can be the opposite. Regardless, I started a long series of experiences that taught me about what China is truly like. The first thing I have to mention about the city is that it is HOT. It’s known for being one of the hottest cities in China, and since it was still September, the temperatures were blistering hot still. Not only that, but Changsha is an especially humid city, and so being outside was really not that fun at all. Despite that, the next morning I awoke and met the assistant from the night before. Thankfully, she was an English major, and spoke English very well, so she was able to help me with many of my questions and concerns. One of my immediate questions was regarding the internet, and how and when I might be able to get it. Unfortunately she wasn’t really able to give me much of an answer. She did however take me to an area behind the foreigner dorm called Back Street, where there are tons and tons of little stores and shops with food, supplies, all sorts of things. She took me to a phone store, upon which I was able to buy a phone card, which would enable me to communicate with friends I had previously met in China, as well as anyone else thatÂ I might encounter. After that, she showed me around the campus some, and I got a good look at what it was like. However, the campus is humongous, and as someone later commented, it resembles a small city. So as I quickly discovered, I really only saw a small portion of the campus. I also discovered later that there are several other campuses that belong to CSU, making things quite confusing sometimes. That said, the campus is actually really beautiful. It lies on the hills of a mountain, called Yuelu Mountain, and so a simple look outside the window in my dorm reveals a very large and very close mountain.Â The campusÂ has quite a bit of trees and even a large lake in front of the library, near the front of a campus. Next to thatÂ is a large grassy area where students and couples often come to sit and talk, and sometimes people bring guitars and live music is played. Anyway, after quite awhile in the heat, the assistant left me to attend to other business, and I returned to my dorm. At this point it was almost 11 in the morning, and the day was young. So, I went to sleep. Although I didn’t actually feel that tired, I really had absolutely nothing else to do. I had no internet (and believe me, I tried VERY hard to steal some wireless internet), I didn’t know anyone, I didn’t know my way around the surrounding area, and I couldn’t really communicate with my roommate either. So I pretty much went to sleep, and that day wasÂ basicallyÂ wasted away, although the jetlag fortunately helped me sleep very well. The next day I did go out and explore a little, and learned a little bit about the bus system, as well as where the nearest KFC and McDonald’s were, but I really didn’t do much, and I still didn’t really know anyone. So my first weekend in Changsha wasn’t too exciting, but this was really the last of the excessive free time I would have, as things changed very rapidly the next day. The next day I was supposed to go to the Overseas Office to meet with the staff and receive my textbooks. Well, I woke up early the next morning, and quickly realized that no one had actually told me where the building was or where to go, and as I spent the next 45 minutes or so walking around, I discovered it’s not that easy to find a building like that in a huge campus. Eventually I called the assistant that I had met and asked her if she could help, but she had her own classes to attend and could only tell me the name of the building and the general area that it was in. So, I spent a little while longer walking around, going down every passageway I could find. After getting pretty frustrated, I finally stumbled down a path I hadn’t noticed before, and I found the building. When I arrived and went into the office, I was the only student there, and the staff quickly took my passport and information and gave me my textbooks. I had a look, and what do you know… no less than 16 textbooks. Yes, that’s right, 16 textbooks. How many classes do I have? Only 4. Now, to be fair, not all of those textbooks are intended to be used simultaneously. As it turns out, the 4 classes that I have are: Grammar, Writing/Reading, Listening, and Conversation. Most of the books are a series of books, intended to be used one level at a time. For example, the Grammar class has 6 books.Â These books are divided intoÂ 3 levels, so there are 2 books per level, and within each level is a beginning and an end book (ä¸Š and ä¸‹ for those of you that can read Chinese). Each book has about 15 chapters, so there’s quite a lot of material to cover for just that one class. Aside from Grammar, the Writing class has 3 books, the Listening class has 4 books, although one is just an answer book, and the Conversation class has 3 books as well, all with roughly around 30 chapters each. So normally, only 4 textbooks are used at a time, which is reasonable. But there’s still a lot of material to cover, and things move very quickly in most classes, so you don’t usually stick with one book for more than about 2 or 3 months. Anyway, after I received my books, and while I was still waiting, a large group of new students came in. I started speaking with them, grateful to have someone to speak English with, and discovered that the majority of them came from various countries within Africa, the exception being two girls that came from Jamaica. Two of theÂ students had been there for awhile, and were helping the newer students with what they needed to do. They offered to help me out as well, and so I spent the day tagging along with them. The first stop was the bank, as we needed to set up a bank account so that the school could deposit our scholarship stipends into our accounts each month, which is 1700 RMB, or roughly $255. After that, we went to a street near the dorms called Business Street, where there are also a lot of small shops and stores, and we picked up some supplies before heading back to the dorm. Then, since it was almost time for lunch, one of the Jamaican girls that was an older student offered to take me and the newer Jamaican girl into the city for some lunch and shopping, along with an African guy who was also an older student. Eager to see more of the city, I went along. Changsha is divided in two by a river, called Xiang Jiang. CSU happens to lie on the western side of the river, while the downtown area happens to lie on the eastern side, with some islands in the middle of the river. So, we took a taxi into downtown, and ended up only spending a little over $2 for the entire ride. Not per person, altogether. The first stop happened to be a place I was very grateful to see: Subway. There’s only one Subway in Changsha, but that’s all I need. The food is almost identical to the way it is back home, in contrast to the KFCs and Pizza Huts in China, which are vastly different. So, naturally I was very grateful to find this place. After lunch, the next stop was yet another familiar place: Wal-Mart. Although the Wal-Mart here is quite different from the Wal-Marts from back home, the idea is the same, and I was able to find many useful things, as well as certain types of food that are difficult to find elsewhere. While I was here, I was approached by a lady who offered me a part-time job teaching English to children. While I was naturally a bit surprised to have been offered a job on my 3rd day in China, at Wal-Mart of all places, I later discovered that the situation was actually not that weird at all, which I’ll get into later. After this, we left Wal-Mart and came back to the dorm, at which point I was informed that due to the fact that I am on scholarship while my roommate is not, it was advised that I move to a different room to avoid financial complications regarding electricity. Basically, once electricity runs out, students have to pay for more until the school recharges their electricity account every 3 months. This move was in order to prevent any complications that might arise from the situation. So, after relaxing for a little bit and going to get dinner, that evening I started the long process of moving everything in my room from the 5th floor of one building to the 5th floor of another building. Inside ofÂ the foreigner dormitory there are a series of buildings very close to each other, each with 6 floors. To get to each building, you have to be on the first floor and walk through a very small outside courtyard. My new building was a few buildings down, so needless to say, transferring everything I owned was not very fun. Eventually I did complete the task however, and I discovered that I didn’t have a roommate, and that my room was larger. It seemed like a pretty good switch to me. However, as I quicklyÂ discovered, there were other issues… such as a lack of working air conditioning. Thankfully, some Indonesian students that live in my building were able to help me communicate my problems, and although they did not get fixed, someone was at least aware of the problem. TheÂ rest of theÂ week was a brutal andÂ depressing one. Classes weren’t scheduled to start until the following week, and so I had more free time than I knew what to do with. I had little relief from the sweltering heat (just a ceiling fan), I really didn’t know many people, I still had no internet, and homesickness was starting to set in, with no real way to contact anyone from home. By the end of the week I was more lonely and depressed than I’d ever been in my entire life, and probably ever will be. Without a roommate, the only real people I could talk to were old friends from other places in China, and even then, it was really only through text messages. You might think it would be easy to find people to talk with. In some ways, it is, because most of the foreignersÂ doÂ speak English. However, there isÂ a bigÂ difference between the foreigners inÂ Beijing and Shanghai and in the rest of China: the number ofÂ foreigners are much lower, and their countries of origin are quite different. Even though I live in a foreigner dormitory, I am the ONLY American around. The closest person to that is a Brazilian guy who happened to live in London for a little while. The majority of students are from AfricaÂ or the Middle East, with someÂ from a few places in Asia such as South Korea or Indonesia. But as for Westerners, I am unfortunately very alone, and so the cultures between myself and others are immensely different. So while yes, communication with others was possible, and in fact most of the foreigners are very friendly, most people in the world tend to form cliques and feel more comfortable with people similar to them. Since I was the only one of my kind, it made it difficult to find someone to really talk to and feel comfortable with, and so to put it simply, the week was extremely depressing, without any real way to contact my friends or family. I never felt so alone. I spent a lot of my time taking walks around the campus or other nearby areas, getting familiar with my surroundings. I discovered that there is a lot of beautiful scenery here, and many interesting areas worth exploring. However, I wasÂ still alone, and that made things hard sometimes. Life improved enormously during that time. Things got fixed, I settled in and got used to things, I made some new friends, and I learned the layout of the city pretty well. Classes were pretty interesting too. However, there were quite a few surprises to get accustomed to when classes started. First of all, I have to explain the system in place for foreign students at CSU. Most foreign students here come with the intention of completing a graduate degree of some sort, not with the intention of learning Chinese. As I’ll say plenty times more, that’s another difference between Beijing and Shanghai and the rest of China. In those big cities, many foreign students are mostly from America or Europe or other similar places, with the intentionÂ of studying Chinese. Some do come for a full degree, but there are quite a few that don’t. That’s because thoseÂ cities are regarded as better for learning Chinese. I’ve come to strongly disagree with that however, which I’ll get into later.Â In the rest of China, many of the foreign studentsÂ come from countries that don’t have strong universities, and so they come to China for better education. Therefore, many foreign students that come here don’t know any Chinese at all. The school then requires that foreign students completing a major that is to be taught in Chinese must complete a year-long course in Chinese. This also involves completing an exam called the HSK at the endÂ of the school year, similar to the TOEFL for English. Upon completion of the HSK, and obtaining a satisfactory score, one is granted with a certificate stating that they are able to communicate in Chinese, and are able to obtain a degree that is taught in Chinese (it can also be used for jobs). Some students have majors that are taught in English, and are exempt from this, but many are required to take it. With that said, since most new studentsÂ don’t know any Chinese, the classes basically start at the very beginning. I, on the other hand, hadÂ studied it at UofL for 3 years prior, as well as two summer study abroads in Beijing. Needless to say, I was not a beginner. I spoke to my teachers and the office about this, and requested to be moved to a higher level class, but I was told that no such thing existed at the school. However, they did mention that the classes move very quickly and that the material covered is quite extensive, and that before long there would be many new things for me to learn. It turns out they were quite right, and although things were very slow and boring at first, they did pick up and after a couple of months, I started learning a lot of new things. In a way, this was actually incredibly beneficial for me, becauseÂ it forced me to review many things that I had already learned, and so I was able to improve upon the basics tremendously, greatly enhancing my control of tone usage and writing characters especially, things that were only briefly covered at UofL. Had I gone to Beijing as I originally expected, I would not have had this opportunity, and may have struggled to master some of the later parts of Chinese. Looking back, I’m really glad that I had the opportunity, as I think it has and will definitely hlep me in my future studies in Chinese. Another difference between the classes that I’m in now and the classes that I would have had in Beijing is that, as I mentioned, the students in my class here are here for a real degree, and need to be able to communicate in Chinese very well within just 1 year. The classes in Beijing are designed for students who have the luxury of time, and thus things do not always move as quickly or as efficiently, simply because those students do not have a pressing need to learn the language. If they don’t get to complete the textbook by the end of the semester, or the students don’t learn the language well, it’s really not hurting anyone. But here, if the students can’t communicate well by the end of the year, they have to complete another year-long course of Chinese, and have to delay completing their degree by another year as well. That’s not really good for anyone, and so the classes are taken pretty seriously here and a lot of material is covered in a short amount of time. With the HSK always in mind, many students prepare far in advance for the test to come. Next I’ll talk about myÂ classmates a little bit. If I had to pick one word to describe my classmates, it would be: doctors. Just about every single one of them is a doctor or studying medicine of some kind. Therefore, most of them are highly intelligent and well-educated, and thankfully for me, most of them can speak English pretty well. Some of them are a bit older, with many of the women being married andÂ having kids. The men range in age, with the youngest being around 19, and the oldest being in his 40’s. Also, most of them are from the Middle East, with quite a few being from Yemen, but there are also students from various countries in Africa, as well as Mauritius, and there’s even an Indian guy and my old Vietnamese roommate. There’s another class for students learning Chinese as well, and they also consist of a similar group of students, although they have greater variety, including my Brazilian friend, the Jamaican girl I met, several Koreans, students fromÂ other parts of Asia, some Africans, and a few guys from Turkmenistan. As I said before though, I am the only American around, and also one of the only white people in the area, and so I stick out like a sore thumb in these classes. As for friends, I have a core group of guys that I spend a lot of time with. The Brazilian guy is naturally one of my closest friends, as he is one of the few Westerners around and one of the only people that I can speak English with freely. With him, I can communicate just like I would back home. With anyone else, I have to be more careful with my English and often times I have to explain some things that I say, or slow down when I speak. His roommate is from Bangladesh, andÂ although he speaks English very well, he doesn’t know all of the slang or cultural references that the Brazilian guy and I speak about. He is one of the students studying a major taught in English, therefore he knows no Chinese and isn’t learning any either. Many humorous situations occur as a result of this. The last guy is a classmate of mine from Egypt, and due to his doctor status, we like to call him Doctor. He is by far one of the most unique people I’ve ever met, but he is also one of the most polite and genuinely nicest guys I’ve ever met as well. I have quite a few hilarious stories thanks to this guy, but now is not the time to share those. Altogether, we have a pretty diverse group of guys. There were several other differences to get used to here in Changsha. One of the biggest differences is the food. Anyone who knows much about China will tell you that two provinces in particular are famous for spicy food: Sichuan, and Hunan. Here’s a little bit of trivia for most of you: while both provinces are famous for exceptionally spicy food, Hunan’s food is generally considered to be spicier and hotter in temperature, due to their liberal use of chili peppers in cooking, whereas Sichuan’s food uses peppers that have a more mouth-numbing effect. So, getting used to spicy food has been quite a task. Thankfully, you can usually tell them not to use peppers, and the food is still basically the same. But part of the experience of being in a foreign country is trying the food the way the locals cook it, and so I’ve spent a lot of time eating spicy food too. While I’m not particularly fond of spicy food, I have begunÂ to grow a taste for it. Aside from spicy food, there are tons of other dishes to try. The food differs quite a lot depending on the region of China, and so food that I got used to in Beijing isn’t as common here, and vice versa. And of course if I ever get sick of that stuff, there are more McDonald’s and KFCs around than I’ve ever seen in America, as well as Subway and a few other places. All in all, the food is one of the more enjoyable experiences of being in China. One of the other major differences that I’ve had to get used to in living here, and is something that I never experienced when I studied in Beijing, is the importance of religion to the foreign students. Most people know that China is considered an atheist nation, and most people don’t practice any religion in particular. Despite that, at least in Changsha, there are quite a large number of Muslims, and that is without a doubt the dominant religion of the foreign students in Changsha. Being here, I have learned far more about Islam than I ever thought I would know. My Egyptian and Bangladeshi friend are both very religious Muslims, as well as most of my classmates. Thus, when I spend timeÂ with them, I learn quite a bit about their habits and many times have to be accepting of them as they differ from my own. Most people know that Muslims don’t eat pork. However, that is only the tip of the iceberg. As I’ve come to learn, food is a very particular issue for many Muslims. Not only do they not eat pork, but with any other meat that they eat, the animal MUST have been killed in the Muslim way, or you cannot eat it. If there is any sort of pork or alcohol used in any of the ingredients, or even if a pot or pan that cooked something with pork in it earlier is used, Muslims will not eat it. I’ve actually witnessed my friend ask a worker at a cake shop if there was any pork in the cake. Now, I’m not saying that it’s impossible for there to be pork in the cake, but I’ve never seen or heard of such a thing. That just goes to show you how careful some are willing to be. Most of my Muslim friends are very particular about food, and generally eat from only Muslim restaurants. Which means in a typical schoolweek, they eat the same food twice a day, every day. Not all of the Muslim students are this particular, and in fact some will even drink alcohol, but my friends at least are fairly devoted to their beliefs. Food is not the only issue however, there are many social habits that my friends have that neither I nor the Chinese are familiar with, however to go into detail with that would take far more time than I am willing to at this time. I’ll simply say that in many situations, I feel far more relaxed with Chinese friends than I do around my Muslim friends. Finally, one of the biggest differences between life in Changsha and the rest of China as opposed to big cities like Beijing and Shanghai is the way the people treat you. In Beijing and Shanghai, as manyÂ of my fellow classmates will agree with, you do get stares, and you do get people coming up to you wanting to be your friend or just speak with you because you look foreign and speak English. But outside of those cities, you might as well multiply that by 10 or 20. Foreigners are much more rare in other parts of China, and so the people are not nearly as used to them. Changsha for example is aÂ very large city (with aroundÂ 6 million inhabitants in its adminsitrative area), and is even the capital of its province, yet walking in the streets people will still stare at you regularly, and young people especially will come up and speak with you. The attention that one receives here is beyond anything that I have ever come close to experiencing in my life, even in Beijing. Many times, just walking in the street makes you feel like a celebrity, and in my case this is especially true. As I mentioned several times already, I am one of the only Americans around. There are even very few white people around, as most foreigners here come from Africa or the Middle East. Those that are American or white are all English teachers, and most are a bit older. There are very, very few young, white Americans around here. So when I’m out and walking around, I really stand out, and people take advantage of that. This has really helped me to see how people outside of America, specifically those in China, really view us. I have no idea why they like us so much, but I will say that the Chinese people in China are some of the friendliest people that I have ever met. I specify that they’re in China because naturally, mostÂ Chinese elsewhere have been influenced by their environment and are vastly different from Chinese people within China, to the point that in many ways it’s pointless to compare the two, they’re just so different. That’s not a jab at overseas Chinese however, as I’m very fond of them and they are also very friendly, but there’s simply no denying that there are enormous differences between them. Anytime I leave the dorm, even if it’s just walking around campus, people will look at me, and even though they’re often very shy and try to hide it, it’s usually not very difficult to notice. Anywhere I go, people will randomly come up and talk to me, ranging from the more common young, attractive girls to even older men and women. Most of the time the people that approach me are young students, bewildered at the fact that there’s actually a native English speaker around their age in the city. Most Chinese are fascinated by English, and the students are forced to learn a great deal of it, and so naturally they’re very excited to make friends with someone their age who can really help them with it. The downside to this is that I’ve met far more people and received more phone numbers than I can keep track of, and while I love meeting new people and practicing English with them, there is simply not enough time to spend with them all, and sometimes it’s evenÂ difficult to remember the person if you only met them briefly one time. What’s even funnier is that when you meet one person, especially if it’s a girl, it’s not uncommon for them to give several of their friends your contact information as well. So it’s really not uncommon at all to recieve phone calls or text messages from people you don’t know. Chinese also use a program for instant messaging called QQ, which is pretty similar to MSN. There have been many times where I’ll meet a person, exchange QQ numbers, and then later on that night I’ll receive 5+ requests on QQ for permission to add me to someone’s friends list, usually friends of the person I met. However it’s also very common for completely random people to add you on QQ as well, as there is a function for searching for people by age and location. This is always a humorous experience, as the person that sends me a message starts asking why I’m speaking in English, andÂ is then amazed and surprised that I’m American, and even more surprised that out of all the people they could have added, they found me. Of course I know enough Chinese to communicate with them in Chinese, andÂ often timesÂ I do, but I have to admit that a lot of times it’s really fun to use English initially and to see their excitement and surprise. It’s a really fun experience getting to meet all of these new people, and I’ve made some amazing friends out of it. Unfortunately, every now and then it can be a little overwhelming and even a little annoying, as there’s only so much of me to go around, and sometimes I really do have things of my own to worry about. But, being that I am one of the only young Americans around, I have to accept that I am a bit of a diamond in the rough here, and these things will happen whether I like it or not. Fortunately, for the mostÂ part I really do like it, andÂ I truly do enjoy meeting and helping people as much as I can. Often times I look at my life now, and think about what it would have been like had I gone back to Beijing, like I had planned and as just about every other UofL student that comes to China does. I can say without a doubt in my mind, I am glad and grateful that I did not return there. While I love Beijing, and it’s definitely one of my favorite cities, life in the rest of China is so much different and so rich in new experiences. Had I returned to Beijing, I likely would not have had a chance to see the southern part of China anytime soon. Coming to China and not seeing the southern part is a sad experience, because there is a lot of history and a lot of unique things to be found here. I’ve already had the pleasure of visiting Guangzhou and and a smaller city called Yueyang, and IÂ plan to spend New Year’s in Hong Kong, and I can’t wait for more. Not only the amazing cities and differentÂ foods and different kinds of people to meet, but also my experiences learning Chinese are quite different than what they would have been in Beijing. While it’s true that those in Beijing speak “proper” Mandarin (the dialect of Chinese that most people speak, and what I’m learning), which is largely why it’s considered to be the best place to learn Chinese, there are also a lot of foreigners, and a lot of English there, in stores and shops as well as with the people that you meet. In other places in China, not nearly as many people speak English, and thus you’re forced to use Chinese quite a bit more. In Beijing I could get by with English surprisingly easy, but in Changsha, unless it’s with foreign friends or Chinese English majors, I’mÂ not so lucky. I’m a shy person when it comes to speaking Chinese, and this kind of environment is perfect for forcing me to use what I know. I can say that I’ve improved tremendously because of it. Many will say though that those in other places in China, particularly the south, don’t speak proper Mandarin, and most places have their own dialect. This is definitely true, and I’ve had many painful experiences trying to decipher Changshahua, the local dialect here. But the truth is, most people do speak Mandarin pretty well, and once you get used to deciphering the differences in pronounciation (such as the southern part of China’s very liberal mispronunciation of their sh and zhÂ sounds), everything is smooth. And, the teachers and students in universities usually speak Mandarin very well (it’s required for students to learn and use Mandarin in schools all the way from the beginning, so they get quite good at it), and so the environment for learning it inside of the university is really no different than it would be in Beijing or elsewhere. Most young people speak MandarinÂ fine, just without the goofy pirate-like accent that Beijingers often use. As well as this, foreign students learning Chinese in China use pretty much the same textbooks, as they all tend to come from the Beijing Language and Culture Univeristy. Therefore, the lessons and types of learning methods are generally the same regardless of which university you’re in. Rather, it’s the environment around you that makes the most difference. These reasons are why I strongly disagree with the idea that Beijing or Shanghai are the best places for learning Chinese. For me, a place like this is much better, because it’s far more immersive and I HAVE to use Chinese. If I don’t, I don’t get to eat. I don’t get the things that I need. In Beijing, this might occasionally be a problem, but as I said before, getting by with English there is surprisingly easy. This is a good environment, both for learning Chinese, and experiencing a world that is entirely new and exciting to me. While things were rough at first, I’ve really come to enjoy my time here, and I’m truly glad that I had the opportunity to come. I definitely wouldn’t recommend it for everyone though, only for those that truly have a passion for Chinese language and culture, and are alright with giving up many of the luxuries that we’re used to in the West. This is a really great place, and there’s still a long way to go for me. This blog comes a bit late, as I have been back in the United States for about a week now. The reason why I chose to wait until I returned home to write this blog is for a number of reasons, but mainly it is because life in China was quite busy, and I felt that I could organize my thoughts and discuss my experiences much better from the comfort of my own home. With that said, I plan to write a number of blog posts discussing my experiences in China, ranging from topics such as school life, tourist locations, and especially cultural observations and comparisons. It may take some time, but there will definitely be more to follow. First off, I’d like to thank the College of Business for being so supportive in my study abroad endeavors, as well as the very generous donors Mr. and Mrs. Jones. While many students have the luxury of being financially secure and being able to afford trips like this without any serious issues, I am unfortunately not one of those students, and so their help has been a blessing. It will not be forgotten. Now, onto China. This was actually my second time being in China, the first time being last summer on pretty much the exact same study abroad program. Both last year and this year I was part of a group of UofL students studying at Beijing Foreign Studies University (åŒ—äº¬å¤–å›½è¯­å¤§å­¦), or Bei Wai for short. Obviously, this was in Beijing, however we had the opportunity to visit several other cities as well, such as Shanghai, Suzhou, and Xi’an. Bei Wai is one of China’s elite universities, and it is the best and most well-known university for foreign languages. Many students that graduate from Bei Wai go on to work for the Chinese government and have very important and well-paying jobs. Anyway, being at Bei Wai provided a particularly unique experience for us, andÂ since it was such an elite foreign language university, most of the students on campus spoke decent English. This made it really easy to make friends around campus, although there were many friendly students from other countries as well. Life at Bei Wai for a foreigner is pretty good. There are several dorms that foreign students can stay in, and the one that we stayed in was especially nice. To start off with, it wasn’t like a dorm that you would see at UofL or any other university in America, as far as I know. It was actually more like a hotel. You have a single room, a room key, your own bathroom, and there are cleaning ladies that come by every day or so and clean your room, change your bed sheets, and even take out and organize your trash for you. I could go on, but you get the idea. So, dorm life was pretty relaxing, but outside of the dorm there was a lot of otherÂ interesting things as well. Our dorm was located at the back of the east side of campus, and so we were very close to the back gate. Outside of the back gate was pretty much stereotypical, authentic Chinese city life. Lots of great restaurants with cheap prices, tons of people walking and riding bikes everywhere, and at night especially there was a ton of trash. Some people might get turned off by the trash and the smells, but to be honest, for me it was kind of nice to get a taste of real, unfiltered China, and it was kind of refreshing to see how laid-back and carefree the people were. I’m not saying I would want to be around that kind of stuff all of the time, but it’s definitely unique and enjoyable in small doses. Especially at night, things really pick up behind the dorm. They have areas set up outside where anyone can come by and sit down and drink beer and eat food for ridiculously cheap prices. A bottle of beer is around 3 yuan, which is less than 50 cents in American currency. And when I say a bottle of beer, you should know that these bottles are nearly twice the size of what an American bottle of beer is. The catch however is that the beer is a bit weaker than what you may find in the West. One of the popular local beers in Beijing for example is Yanjing, which is around 3.6% by volume. So while you do get a much larger bottle, the beer isn’t quite as strong. But for less than 50 cents a bottle, does that really even matter? The food is even cheaper, and for between 1 – 2 yuan, you can get some meat on a stick (similar to a kebab), such as chicken or squid (as well as other kinds of meat). You have to be careful with these items though and not eat too many, because they aren’t exactly cooked in the cleanest of ways. However, they’re very very delicious and definitely worth having from time to time. So all in all, one can have a great night, end up both full and drunk, and come away having spent less than $5 (unless you’re a regular drinker, in which case you may have to spend another dollar or two). While this may not be the activity of choice for everyone, it’s definitely worth trying. When studying at Bei Wai though, you don’t always have the time or energy to go out and do things like what I described above. If you’re serious about learning Chinese, you’ll find yourself constantly wishing thatÂ you had more time in the day to study and practice. 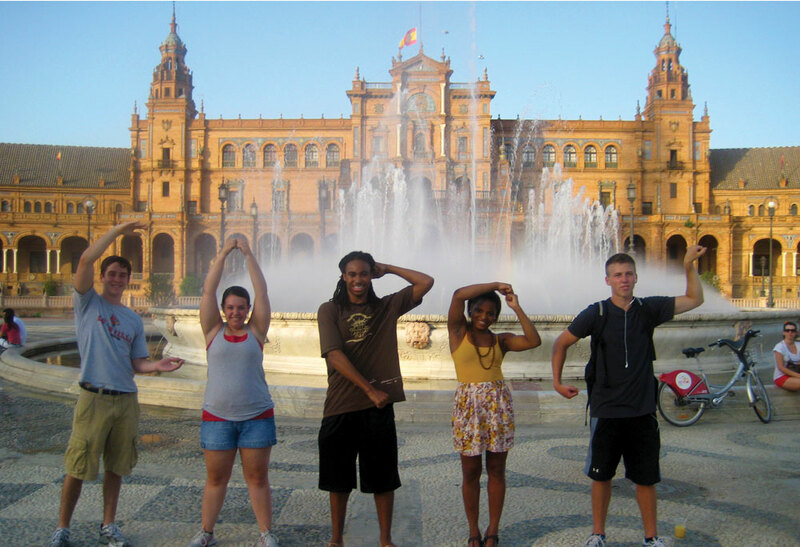 On the UofL summer study abroad program, students are usually in class for 4 hours a day, from 8 in the morning until noon, Monday through Friday. This leaves students with plenty of time after class to go out and explore the city. Some students choose to go shopping, some like to go to tourist areas, and some just like to walk around and see new things. Needless to say, by the time 9 or 10 hits at night, most students are pretty tired. Some still find the energy to go out and have a good time, but it definitely takes a toll on you and it catches up to you pretty quickly. This year however was a bit different for me and two of my classmates, as we were placed into a special classroom and were taught a bit differently than the rest of our UofL classmates. The reason for this was simple: Bei Wai could only guarantee two private classes for UofL, and this year we had three different levels that needed to be taught. Some students were studying at the 200 level, some at the 300 level, and I was at the 400 level (equivalent to second year studies, third year studies, and fourth year studies, respectively). The 200 and 300 level students were given their own private classrooms and were taught on their own with the scheduleÂ I described above. My two classmates and I however had the real fun. Since there simply weren’t any available staff to create a third private class, my two classmates and I were thrown into a class that had already been going on for an entire semester. At first, this seemed absolutely ridiculous to us. It was literally the end of the semester at Bei Wai, and we’d missed a minimum of 3 months of material. Needless to say, we were a bit frustrated and overwhelmed at first. Not only this, but our schedule was quite different from the rest of the UofL students. Instead of being in class from 8 -12 everyday, our schedule ranged from Monday – Thursday, and each day was a different schedule. Sometimes we would have class from 8 – 12, sometimes we could sleep in until 10, and sometimes we would even have an afternoon class. We also had two classes, one was called Hanyu and one was called Kouyu. Hanyu focused more on actually teaching you new material and learning to read and write it, as well as grammar. Kouyu on the other hand focused on learning to speak and pronounce words better.Â At first, it was very difficult to adapt to these classes. Not only were we way behind in material, but it was very hard to understand everything that the teachers were saying. There were many times when we were confused and unsure of what the teachers were telling us, and many other times when we felt unable to answer questions or fully express how we felt. English was very rarely used in class, and so we had to improve our Chinese very quickly if we wanted to keep up with the class. It was tough at first, but over time we got used to things and grew to enjoy it a lot. We were also in a classroom of students that came from all over the globe. There were students from Canada, France, Spain, Japan, Korea, Russia, Uzbekistan, and other countries as well. So, we were able to meet and make friends with a variety of different people, and that was an interesting experience in itself. I have to say however, thatÂ the Canadians were by far the most friendly and helpful, and if it wasn’t for them, life would have been a whole lot more confusing. The Canadians were the ones who told us what our schedule actually was, and were the ones that let us know what material was being covered when we first arrived. They were always very friendly, and were always up for a chat and regularly offered to share their food (they always knew where to get the best snacks too). Everyone was very friendly though, and I only regret that we were unable to spend more time in the classroom getting to know them better. Each day after class, all of the UofL students would try to meet up and go somewhere for lunch. Usually this ended up being one of the school cafeterias, which were also very very cheap. Although the food wasn’t always the best quality, I found it to be pretty enjoyable for the most part. After lunch, we would usually relax for an hour or two, and then meet in the lobby and go somewhere out in the city. Sometimes this would be to famous areas like the Summer Palace, but many times we would go out and do some shopping. We would usually stay out pretty late, and would often eat dinner while we were out. Sometimes dinner would be at a Chinese restaurant, but a lot of times our cravings for Western food would be too much to resist, and we would go to a McDonald’s, Pizza Hut, or even more often, KFC. These restaurants are a bit different from their Western counterparts though. The buildings are usually much nicer and cleaner, and the menus are slightly different. McDonald’s and Pizza HutÂ were pretty similar to how it is in America, at least for the items that I ordered, but there were some changes to the menus, and Pizza Hut is definitely a lot fancier and more like a real restaurant. KFC on the other hand was probably the most different, as it had a variety of interesting items on its menu. They served chicken nuggets, as well as french fries, ice cream, and even chicken sandwhiches that had things like shrimp packed inside of it. There was also a crunchwrap item similar to what one might find at Taco Bell in the USA, and some of us suspected that it was Yum!’s way of introducing China to food that Taco Bell might serve, as Taco Bell unfortunately has yet to make its way into China. All of these fast food restaurants were pretty good, but we tried to limit ourselves from them so that we could fully enjoy the Chinese cuisine available in Beijing. After a long day of touring the city, most of us were pretty exhausted and we usually had homework of some sort. So by the time we got back at night, we were more than ready to relax, and for the first week or so, our feet would be aching at the end of the day as our feet were unused to walking so much every day and without much rest. Most days would be similar to what was described above, there were very few days where we actually spent a lot of time relaxing. Of course, it was always worth it. When you’re only in a country for such a short time, you want to see and do everything that you can, even if it means having sore feet for a little while. In this introductory blog post, hopefully readers will be able to get a feel for what things were like for us at first, and what a typical day might have been like. I didn’t want toÂ go into too much detail as far as specific events or places go just yet, however future blog posts will go much deeper, and I plan to write a lot more about my own thoughts and observations about the country. I have a lot to share from my experiences, and sometimes my thoughts may not appear in the most organized way, but I’ll try my best to articulate them as best as I can. Any comments or questions, or suggestions for topics to discuss, are more than welcome as well.Â With that said, this will end my first blog post. Look for more to follow (as well as pictures), as soon as I have the time to sit down and organize my thoughts.